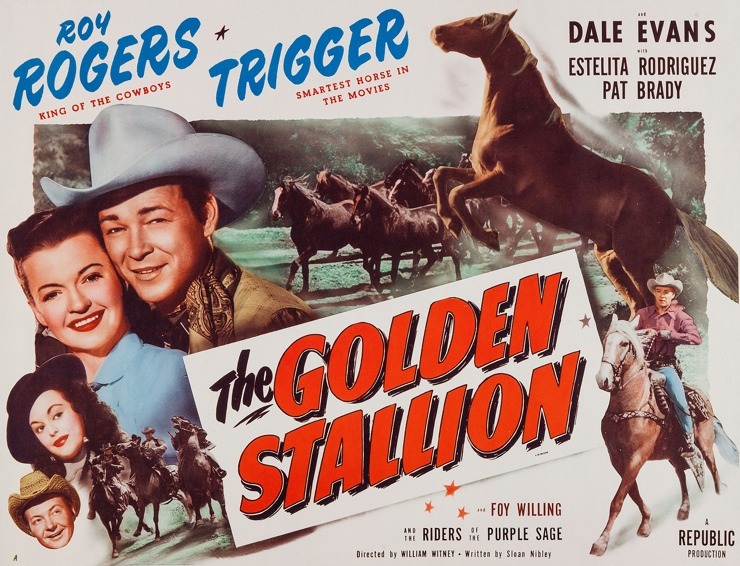 Of the more than 70 oaters that starred Roy Rogers, Dale Evans, and Trigger (the smartest horse in the movies), The Golden Stallion is the best known by today’s film geeks. The reason for this is an article published in the September 15, 2000, issue of the NY Times called “Whoa, Trigger! Auteur Alert!”, in which Quentin Tarantino waxed rhapsodic about the films of William Witney. I remember reading the article when it was first published and being immensely pleased. The writer of the piece accurately called Witney “a now all-but-forgotten journeyman director,” but I’ve been a fan of his serials since I was in high school. I watched a lot of serials when I was younger, and it was hard not to notice that the cream of the crop all bore his name as director. Along with his frequent co-director, John English, Witney made one memorable Republic serial after another, like Drums of Fu Manchu (1940), Adventures of Captain Marvel (1941), Jungle Girl (1941), Spy Smasher (1942), The Crimson Ghost (1946), and others too numerous to list here. In the postwar era the market for serials started to dry up, and Witney turned to making westerns for Republic Pictures, including many with Roy Rogers. Tarantino loves what Witney did with Rogers’s films during this period. Tarantino is absolutely right. Witney was an old hand at directing knock-down drag-out fistfights in serials, and he brought this experience to his features with Roy Rogers. 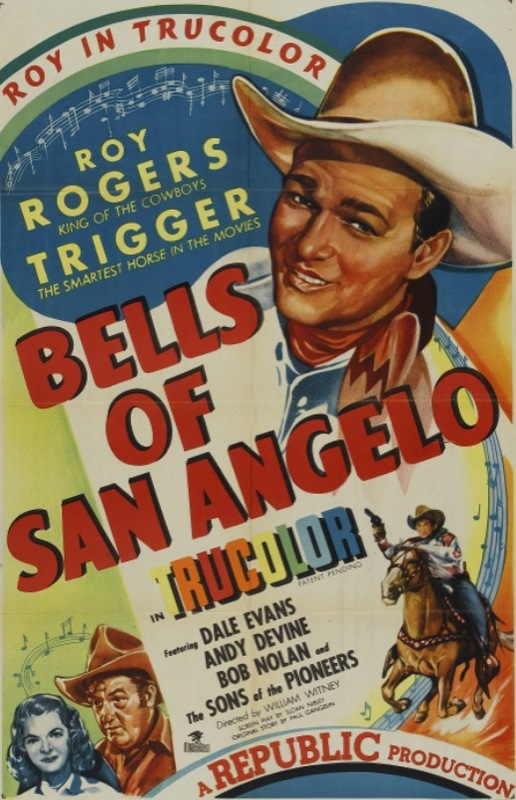 The best fight I’ve seen in a Roy Rogers film that Witney directed is probably the one in Bells of San Angelo (1947), but all of their collaborations had plenty of action, and The Golden Stallion is no exception. What I found most impressive about The Golden Stallion were not any of the fight scenes, but rather the scenes of Trigger galloping at the head of a herd of wild horses. These sequence appear to have been filmed from a jeep, and they’re full of speed and drama. So is The Golden Stallion — as Tarantino claims — the best film that Witney and Rogers made together? That’s hard for me to say, because their films were of such a consistent level of quality (for better and for worse). Like all of their other films, The Golden Stallion had a low budget, a tight shooting schedule, and hokey humor. But it has a better-than-average plot (about a gang smuggling uncut diamonds over the border hidden in horseshoes nailed to the hooves of wild horses), a great scene where Roy has to make an enormous sacrifice to save Trigger’s life, and some really beautiful filmmaking. If you like B westerns — especially if you like B westerns with singing cowboys — you really can’t go wrong with any of the Roy Rogers films that Witney directed. 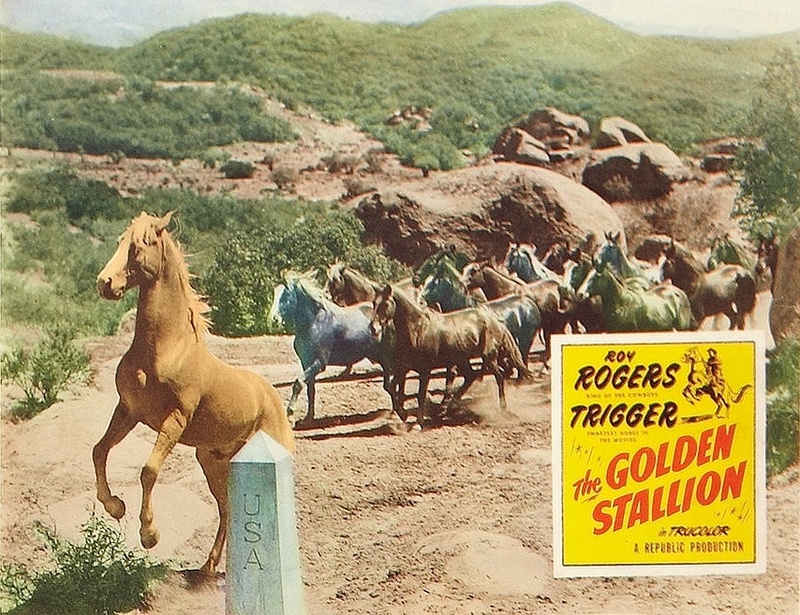 But if you’re unsure about B westerns and you want to see just one, check out The Golden Stallion. Just make sure you watch the full version, which is 67 minutes long. There’s a truncated version that’s less than an hour long currently on YouTube, but the full color version is available to stream if you’re an Amazon Prime member. Posted in 1949, November 1949 and tagged Dale Evans, Estelita Rodriguez, Pat Brady, Quentin Tarantino, Republic Pictures, Roy Rogers, Trigger, Westerns, William Witney. Bookmark the permalink. 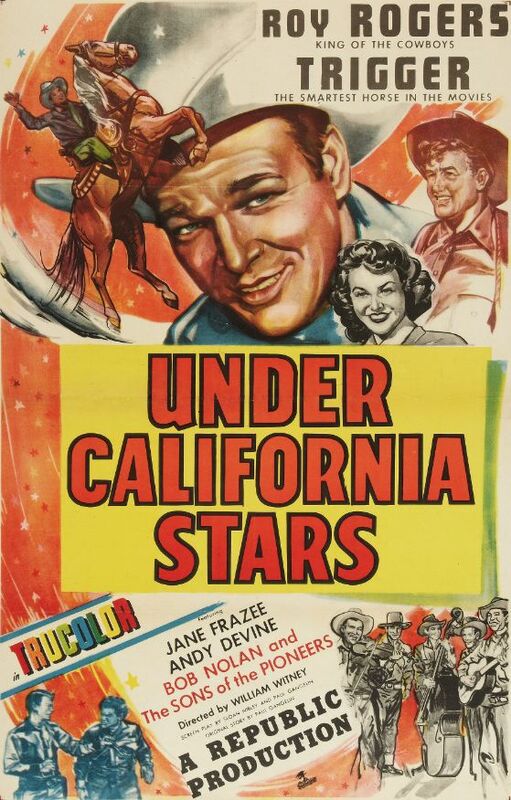 Like most Roy Rogers movies made in the post-war ’40s, Under California Stars was directed by William Witney, a veteran B-movie director born in 1915 who had nearly 40 westerns and serials under his belt by 1948. Witney was a brilliant director of action. He was reportedly inspired by watching Busby Berkeley direct big musical numbers in which different takes were designed to be cut together for a coherent whole. Before Witney’s innovative work on action serials, most directors would just train the camera on the stuntmen and let them do their thing, but Witney took a more active role, arranging action set pieces that incorporated elegant camera movements and effective cutting between actors and their stuntmen doubles. The serials he directed for Republic Pictures were done on a tight budget and an even tighter timeline, so Witney often directed the action segments while his frequent collaborator John English handled the dialogue scenes. (Witney and English directed Adventures of Captain Marvel , which I consider the greatest serial ever made.) Witney’s film work is a far cry from today’s hyperactive, chopped-to-hell action movies, but in many ways he is the father of the modern action movie. Under California Stars isn’t wall-to-wall action, but the fight scenes are well-done, and like most Witney joints, it’s a classic example of good B filmmaking. The action quickly shifts from Hollywood to the Double R Ranch, where Trigger and Roy are met by foreman Cookie Bullfincher (Andy Devine), as well as Bob Nolan and the Sons of the Pioneers, who sing a hymn to Roy’s good-natured greatness. Roy is also presented with a 10-year anniversary cake and does a radio broadcast from the Double R in which he sings “Dust,” one of the songs that made him famous. But not everyone is thrilled to pieces about Roy Rogers and his marvelous horse. Lige McFarland (Wade Crosby) and his henchman Ed (House Peters Jr.) resent the handsome do-gooder and hatch a scheme to kidnap Trigger and ransom him for $100,000 … or else. Under California Stars is a brisk, well-made Saturday matinee western with good songs and hard-hitting action. The whole film is currently uploaded to YouTube, and you can watch it by clicking on the link below. It’s also currently available to download from archive.org. Posted in 1948, April 1948 and tagged Andy Devine, Bob Nolan, Jane Frazee, Musicals, Paul Gangelin, Republic Pictures, Roy Rogers, Sloan Nibley, The Sons of the Pioneers, Trigger, Westerns, William Witney. Bookmark the permalink. Out California Way is filmed in “Trucolor,” a two-color film process owned by Republic Pictures, and throws Hale into a metafictional world that pulls back the curtain and allows boys and girls at the Saturday matinée to see what might be going on behind the scenes at Republic with all of their favorite cowboy stars. Hale doesn’t sit quite as tall in the saddle as Republic’s big boys, Gene Autry and Roy Rogers, but he’s self-effacing and charming enough to be believable when he says he’s “just a plain cowboy trying to break in” to the movies. He’s assisted by little Danny McCoy (Bobby Blake, famous for playing Little Beaver in the Red Ryder series), who’s trying to get his horse Pardner into the movies. Opposing them is the prima donna Rod Mason (John Dehner), who’s a big radio star as the “Robin Hood of the Range,” and has a career in pictures, too. Little Danny McCoy is president of the Rod Mason Fan Club, but that changes pretty fast after he actually meets the guy. Not only is Mason temperamental and nasty to his co-stars, but he hates children and animals. After threatening to whip Pardner if Danny doesn’t get him off the set, it’s clear that Danny has room in his heart for another cowboy actor. For that matter, so does his young, pretty mother, Gloria (played by Lorna Gray, who’s just 16 years older than Blake). Hale’s an expert horse trainer, and together he and Pardner form a great team. Originally cast as stunt actors on one of Rod Mason’s pictures, they do such a good job that every rewrite comes back with a bigger role for Hale and a smaller part for Mason. Mason and his sidekick, stunt rider Ace Hanlon (Fred Graham), are typical black hats, so they stop at nothing to foil Hale and Pardner’s success. While performing a stunt, Ace throws short-fuse dynamite at Hale that doesn’t kill him, but totally blows Pardner’s nerves. Hale takes time off to retrain Pardner and help him over his trauma, but Mason and Ace immediately undo his hard work by sneaking into the corral at night and freaking out Pardner all over again by repeatedly firing a revolver near his head. 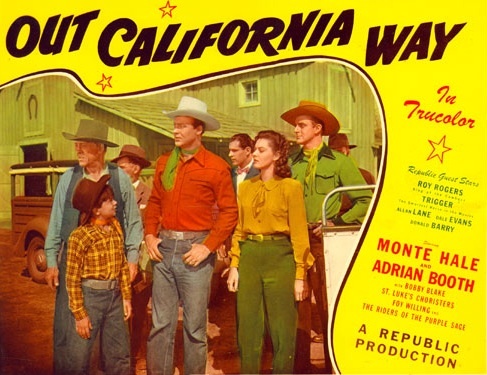 On his journey from “plain cowboy” to movie star, Hale is joined by special guest stars Allan Lane, Don “Red Barry,” Dale Evans, Roy Rogers, and horse Trigger, all members of Republic Pictures’ stable of western stars, and all playing themselves in the sequence in which Hale gives Gloria a tour of the studios. Roy and Dale perform a nice rendition of “Ridin’ Down the Sunset Trail” for them. Not bad for a first date. Posted in 1946, December 1946 and tagged Adrian Booth, Allan Lane, Barry Shipman, Betty Burbridge, Bobby Blake, Bud Thackery, Charles Craft, Dale Evans, Don "Red" Barry, Don Barry, Donald Barry, Edward Keane, Foy Willing, Fred Graham, Jimmy Starr, John Dehner, Lesley Selander, Lorna Gray, Louis Gray, Monte Hale, Musicals, Nathan Scott, Nolan Leary, Out California Way, Republic Pictures, Robert Blake, Roy Rogers, St. Luke's Episcopal Church Choristers, The Riders of the Purple Sage, Tom London, Trigger, Westerns. Bookmark the permalink. 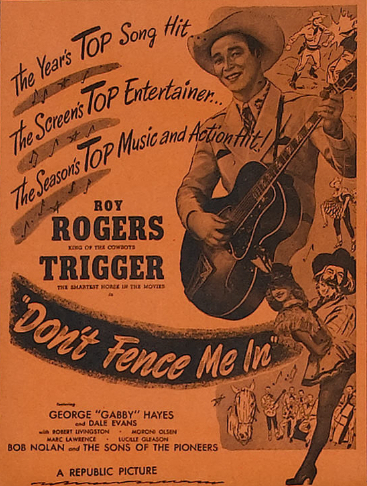 Don’t Fence Me In is a particularly good Roy Rogers picture. Directed by John English (who with William Witney directed some of the best Republic serials of the late ’30s and early ’40s), it’s a well-paced, exciting, and thoroughly enjoyable B western. And investigate we shall, but the job will fall on the pretty shoulders of a girl reporter named Toni Ames (Dale Evans). Toni has enough moxie to make an 800-pound gorilla stop dead in his tracks. When we first meet her, she’s performing the song “A Kiss Goodnight” while dancing on the table at a hot party in a big city, displaying her shapely gams to maximum effect. She’s doing it all for a story, though. A reporter for a tabloid called Spread magazine, Toni is undercover, secretly snapping shots of the party’s guest of honor, a dirty old cad named Cartwright (Andrew Tombes) who’s running for mayor as an incumbent. The plot eventually takes Toni out west to the R Barr Dude Ranch to investigate the legend of Wildcat Kelly, who it turns out faked his own death nearly 40 years ago and has been living as a regular western Joe named “Gabby Whittaker.” He’s played by George “Gabby” Hayes, and it’s a good part for him. In a lot of these pictures, Hayes was able to just coast on his ornery persona, but Don’t Fence Me In actually gives him something to do. Rogers plays that charming and laconic singing cowpoke character called “Roy Rogers” that he played in dozens of movies. Roy is Gabby’s friend, and the only person who knows his secret. He tries to convince Toni not to publish what she knows about Wildcat Kelly, but she goes ahead with her story, and that’s when things get interesting. There are a group of gangsters whose motives are shadowy, but who clearly want Kelly dead once it’s revealed he is still alive. One of them is played by the great character actor Marc Lawrence, who had a very long career as a sinister-looking hood. This is a fine showcase for all of the regulars from the ’40s Roy Rogers pictures. Bob Nolan and the Sons of the Pioneers back Rogers up both musically and when it’s time for fisticuffs. And the wonder horse Trigger does a high-stepping dance, with Rogers astride him, to an instrumental version of “Don’t Fence Me In,” and even takes a bow when he’s finished. Roy and Dale’s relationship is more antagonistic than in many of their other pictures, but it’s still fun to watch. When she first shows up and tries to stow away in the boot of a coach, Roy tosses a hunk of stinky Limburger cheese in the back with her and takes her on a bumpy ride. She later pays him back by pushing him into a swimming pool. Don’t Fence Me In ends with a delightful rendition of the title song performed by Roy, Dale, and the Sons of the Pioneers, with a few lines added at the beginning about Wildcat Kelly to tie the whole thing together. Posted in 1945, October 1945 and tagged Andrew Tombes, Bob Nolan, Charles Craft, Cole Porter, Dale Evans, Don't Fence Me In, Donald H. Brown, Dorrell McGowan, Douglas Fowley, Edgar Dearing, George "Gabby" Hayes, John English, John K. Butler, Lucille Gleason, Marc Lawrence, Moroni Olsen, Musicals, Paul Harvey, Republic Pictures, Robert Livingston, Roy Rogers, Stephen Barclay, Stuart E. McGowan, The Sons of the Pioneers, Tom London, Trigger, Westerns, William Bradford. Bookmark the permalink. A lot of men were drafted during World War II. Roy Rogers was one of them. With a 1-A classification, he expected to be shipped out in the spring of 1945. Consequently, screenwriter John K. Butler (working from a story by Leon Abrams) came up with a script to showcase Rogers’s leading lady, Dale Evans. When V-E Day rolled around, however, the draft board exempted men over the age of 30 who had children, so Rogers never had to serve. Director Frank McDonald’s Sunset in El Dorado ended up starring both “The King of the Cowboys” and “The Queen of the West,” but Evans is still the central figure, and it’s a great showcase for her sunny persona. Although she has a good pitch, and Kansas Kate was Lucille’s grandmother, Lucille has never been west of Hoboken. In a fit of pique, she runs off on one of Worldwide’s tour buses, determined to see the little town of El Dorado. She’s having a grand old time, singing “Go West Young Man” with her fellow passengers (Bob Nolan and the Sons of the Pioneers), when her drippy fiancé Cecil Phelps, the president of Worldwide Tours (played by Hardie Albright), and her old-maid aunt Dolly show up to spirit her away. Cecil intends to marry Lucille immediately, in Yuma, but she desperately wants to see El Dorado. Trigger tows their car to the nearest town, which happens to be El Dorado. Once there, Lucille explores the remains of the Golden Nugget and discovers a painting of Kansas Kate hanging above the bar. She’s interrupted by an ornery old coot named Gabby (George “Gabby” Hayes) who’s been dropping by the saloon for 40 years to make sure nothing happens to the painting. As Lucille stares at the picture and fantasizes about what her grandmother’s life might have been like, the movie flashes back to the old west, but the narrative continues, as everyone has a counterpart. Evans plays Kansas Kate, Rogers continues to play that character called “Roy Rogers” he played in so many movies, Gabby plays his younger self, and Cecil the drip becomes Cyril the heavy. The plot moves at a brisk pace, and hinges on the coded map to Gabby’s gold claim being stolen by a group of bandits. Roy suspects that Kate was behind the plan, especially since she originally told him she was a schoolteacher, not a saloon owner, in order to impress him. After Roy slugs it out with the toughest guy in the bar, a heavy named “Buster” (Roy Barcroft), he takes over Buster’s position as Kate’s bodyguard. Apparently his first duty as her bodyguard is to perform “Belle of the El Dorado” with Kate and her backup singers in a fully choreographed number. “That’s why I took the job, to find out if you did,” he responds. “Did you find out yet?” she asks. “Oh, just a hunch, that’s about all,” he says, chewing on a piece of alfalfa and smiling. I won’t be giving anything away if I tell you that everything turns out all right for Roy, Dale, Gabby, and Trigger, both in their present-day incarnations and their rootin’ tootin’ old-west versions. The only question I was left with was, since Lucille looks exactly like Kansas Kate, her own grandmother, and Roy looks exactly like the old-west character “Roy Rogers” who presumably married Kate, does that mean that the modern-day Lucille and Roy are actually cousins? Well, probably not, but it couldn’t help but cross my mind. Posted in 1945, September 1945 and tagged Bob Nolan, Bob Wilke, Dale Evans, Dorothy Granger, Ed Cassidy, Frank McDonald, George "Gabby" Hayes, Hardie Albright, John K. Butler, Leon Abrams, Louis Gray, Margaret Dumont, Musicals, Republic Pictures, Roy Barcroft, Roy Rogers, Stanley Price, Sunset in El Dorado, The Sons of the Pioneers, Tom London, Tony Martinelli, Trigger, Westerns, William Bradford, Yakima Canutt. Bookmark the permalink. Lorry eventually finds the Deputy U.S. Marshal badge in his boot and realizes beyond a doubt that he’s one of the white hats. The black hats in Along the Navajo Trail are the representatives of the Santa Fe Drilling Company. There isn’t any oil on Lorry’s land, but the company needs to lay a pipeline through her property, and they’ll stop at nothing to do so. Along the Navajo Trail is heavier on action than some of Rogers’s efforts, and it should please most fans of old B westerns. As usual, Rogers solves problems with haymakers and gunplay, but stops short of ever getting too bloodthirsty, since plot contrivances take care of the worst of the bad guys. The climax of the picture occurs when the final black hat loses control of his buckboard, and it flies over a cliff and he falls to his death (in the form of an especially noticeable dummy). Rogers rides to the edge of the cliff and surveys the destruction with the same look of mild disapproval one reserves for drunks puking in Dumpsters in the middle of the afternoon. At the end of the picture, Rogers, Evans, and the rest of the cast gather to sing “Along the Navajo Trail,” and then they all live happily ever after. Or at least, their characters do. Rogers, Hayes, Evans, and Trigger would all be back exactly two Saturdays later, when Sunset in El Dorado was released into theaters. Posted in 1945, September 1945 and tagged Along the Navajo Trail, Bob Nolan, Dale Evans, David Cota, Douglas Fowley, Edward Cassidy, Edward J. White, Emmett Vogan, Estelita Rodriguez, Frank McDonald, George "Gabby" Hayes, Gerald Geraghty, Musicals, Nestor Paiva, Republic Pictures, Roy Barcroft, Roy Rogers, Sam Flint, The Sons of the Pioneers, Tony Martinelli, Trigger, Westerns, William Bradford, William Colt MacDonald, Yakima Canutt. Bookmark the permalink.